Open the client QBO company you want to review. 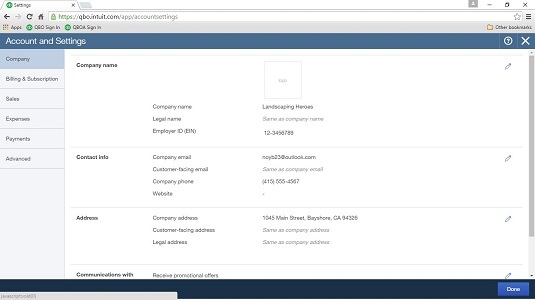 You can click the QuickBooks logo on the Client List page of QBOA, or you can use the list of clients in the QBOA toolbar. Click the Gear button on the right side of the QBOA toolbar to display the Gear menu. From the Your Company group on the left side of the Gear menu, click Account and Settings. 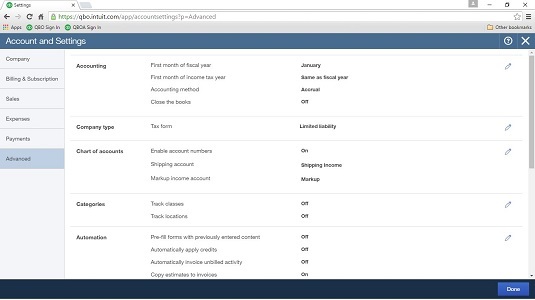 The Company tab (selected on the left side of the Account and Settings dialog box) appears. In particular, set or correct the Company Name, Legal Name, and Employer ID (EIN). To make changes, click any setting. QBO makes the setting options available; make your changes and click Save. Click Advanced on the left side of the Account and Settings dialog box. The settings on the Advanced page of the Account and Settings dialog box appear. The settings in the Other Preferences section includes displaying warnings when duplicate check numbers and bill numbers are used. QBO displays a message at the top of the screen indicating that your changes were saved.